An Accessible Guide to 11 Original Arrangements for Two Cellos. By 2Cellos. Cello Recorded Versions. Pop. Softcover. 80 pages. Published by Hal Leonard (HL.307357). 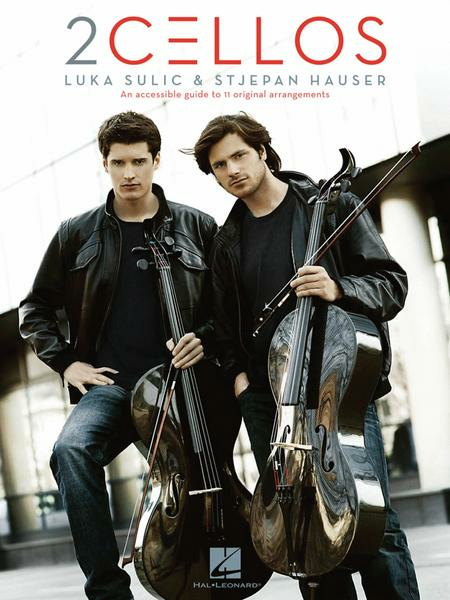 This folio features accessible duet arrangements to 11 songs as performed by Luka Sulic and Stjepan Hauser – rival cellists who joined forces to create unique renditions of popular songs, and became a YouTube sensation in the process. Contains these hits for advanced cello players: Fragile • Human Nature • Misirlou • Resistance • Smells like Teen Spirit • Smooth Criminal • Use Somebody • Viva La Vida • Welcome to the Jungle • Where the Streets Have No Name • With or Without You. The book includes the cello duet arrangements as well as separate pull-out sections for each cello part. June 03, 2014 Great Book! This is quality sheet music with separate parts for cello 1 & 2 in addition to the main book. Not for the beginner. buy and it is well worth the money! It is written in 2 clefs (Bass and treble; mostly in treble because it goes high) but it is not so hard to learn a clef! This book is the best book ever! for the upper register). I'm all for these guys inspiring people on You-Tube, but as far as sheet music goes, I don't believe this is well-written at all. have spent some time making it something people could sit down and read for fun.